Boil chicken and remove skin and bones from the meat. 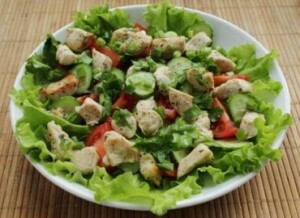 Cut chicken and peeled cucumbers into thin strips. Cut tomatoes into very thin riond slices, chop green onions and dill, and mince garlic. Set aside some cucumbers and tomatoes for garnish. Combine above ingredients in a large bowl, mix well, and season to taste. Arrange a hillock of salad in a serving bowl, top with mayonnaise, tomato and cucumber slices, and green. Add salt spices to taste.